TheMetalBikini.com- X-Wing Miniatures and more: No Gonky Gonk Gonk? Well, there was a little bombshell on the FFG Forums (click on the link for the complete thread) a couple of days ago. Seems there are some questions involving using "Experimental Interface" to use "Gonk's" abilities twice in a single round of actions. This would allow a scum ship with a crew slot (yes Gonk is not an astromech droid folks) to put a shield from your supply onto the card and then regen a shield within the same action. The only consequence would be to receive a stress token. Pretty handy right? But this also leads to some tricky rules that have not been addressed yet. Specifically the rule pertaining to not being able to do the same action twice within your action phase. For example, you cannot double focus with Vader (unless you have a recon specialist which you will never have because of the lack of a crew spot on Vader), or Baron Von Fel (Soontir Fel) cannot Push the Limit and do two boosts or two barrel roles within the same action sequence. 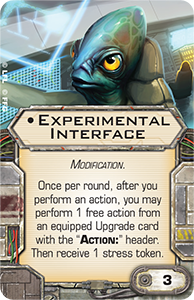 As the card reads it looks like two separate actions because both have the header "Action". However, debate has arising as to if Gonk is considered a two separate action or is it a single action and thus Experimental Interface cannot trigger or be used within the same assign action sequence/step. As such, we took to the airwaves to ascertain what FFG thought of this little predicament. 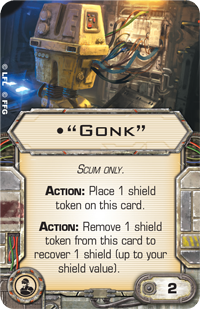 Hi X-wing Miniatures rules question: The new 'Gonk' card has two possible effects on it. Can both actions be used in the same turn via Experimental Interface? Or is the action 'Gonk', preventing it being used twice under the 'same action' rule. You are correct, since both actions are “Gonk” actions, you cannot do both (add and remove) actions during the same round. a) Do you believe that the forums are gospel and not just pixels on the internet? b) Should this ruling be followed immediately or should you wait for the official faq to come out? c) Are people taking things to seriously? Is this post to serious? So essentially, no you cannot use EI and Gonk to get a shield and regen a shield. Or per Mr. Frank's ruling on the forum. As a TO, if it is not in the FAQ or in the rule book, it is up for interpretation. As such, in our league I am allowing the use of EI and Gonk simultaneously. To me the forums are not gospel, but more of guidelines and the final decision lies with the TO.